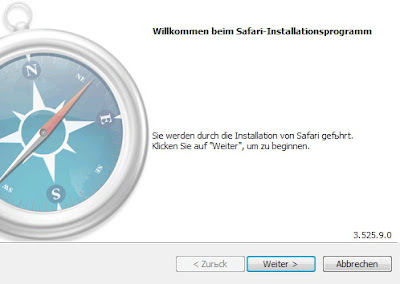 Safari 3 - The world's best browser. Now on Windows, too. 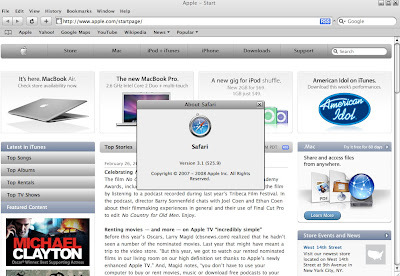 Experience the web, Apple style, with Safari: the fastest, easiest-to-use web browser in the world. Build 31A7 has significant improvements in performance, stability and compatibility. Please review the seed notes for details. Requires: Windows XP or Vista, at least 256MB of RAM and 500Mhz Pentium-class processor or better. This Web Browser works really great. Fast and nice. Developer menu can be enabled to set user agent for example Tiny MCE and other WYSIWYG HTML editors compatible. Some WYSIWYG HTML editors doesn't support Safari with Windows string in UA but work with safari + mac UA. Roboform password manager doesn't have a plugin or extension as of today for Safari Windows. Drosera is like MS Developer Toolbar for analyze Websites and more.